Loved, and continue to love the book - each of my kids has a copy, and I bought another for $1 at Goodwill so I could remove the pictures and post them around my classroom. 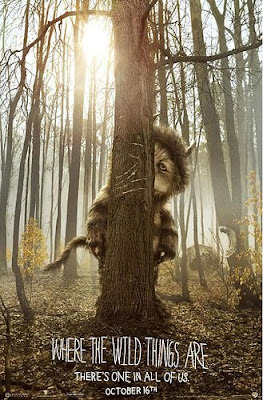 Every spare word of Where the Wild Things Are resonates in my parental mind; whenever my son launches into an astronomical fit or my daughter dissolves into a wailing puddle, I think of Max in his wolf suit making mischief of one kind and another. I take a deep breath, banish them to their rooms, whisper how I'll eat them up, I love them so. And I make sure their supper is always waiting, still hot. The trailers for the movie version made me weepy throughout the summer, with their sweeping cinematography and giant, lovable Jim Henson costumes and funky thoughtful soundtrack. I invested my memories and connections from the book into the film with sky-high hopes and while I wasn't exactly disappointed, I left feeling dissatisfied. As Mason put it when the lights came up, "That's it? He just comes home and eats cake while his mom watches him? I don't get it." We had questions about what next?, unlike we did after finishing the book, because the bulk of the movie is spent on Max's puzzling interactions with the Wild Things but not on what Max learns from the experience. When he comes home in the original story, he has left because he wants to be "where he is loved best of all" and it is clear he realizes wild rumpuses are not, ultimately, the meaning of life. In the movie version, Max abandons the Wild Things in a bit of a shamble, physically & emotionally, before running back to his frantic mom. Not to get too Film Student deep about it, but I felt led to believe the Wild Things were meant to represent different pieces of Max's psyche: Carol, the loud & violent but still endearing leader, was the hurt & confused reactionary 9-year old boy; Judith was the passive-aggressive bully side of him; Ira was the quiet "Watch me do a great job and we can all just get along!" child of divorce; Douglas was the smart & practical Max who knew the right thing to do, even if he didn't always do it; Alexander (physically much smaller than the others) was the sensitive, insightful one everyone ignored. KW seemed to be like Max's mom - trying to find inspiration outside the group while keeping peace within, and protecting Max when the others were out of control. And there was another creature, gigantic but silent, always hovering around but never joining in; I grew weary trying to figure out his message. And that, in the end, was the troublesome part of watching this movie - I felt like I was supposed to be 'getting it,' that each scene should be an "Aha!" moment about Life with a capital L. Where the Wild Things really are, in the book, I could check out of my grown-up life and just let them roar their terrible roars & gnash their terrible teeth for my entertainment while also delighting in the simple presence of unconditional love. There is definitely love in this movie, but unfortunately Jonze & Eggers tried too hard to make us see it. We already knew it would be there; they had us at "Be still!" Uh-oh. I'm now not looking forward to seeing it as much as I was because, like you, I love the book so much that I can probably recite it backwards. And really? I hate being even slightly disappointed by movies. Harumph. as it turns out, the sailor and i took all five kids to it last night. i walked away with the same thing. psyches. bleh. i love the dirt clod war and the snowball fights and was discontent with the sadness they ended with. i didn't like the dig dark guy who always stood alone and never said anything until the very end and then he said, like, meh, nothing. i'm pretty sure my high school boyfriend would've liked it, in a clockwork orange, mc escher way. but we were just all, eh, who cares? it didn't ruin the book though. because it wasn't the book. the whole thing where kw lets him out of her stomach was like she was giving birth to him again. yech. missed its mark. When you didn't squeal Friday night on FB about this movie, I knew it must have missed the mark. It's a hard mark to make, out of such a beloved book of so few words. Still, my hopes were high and this is just what I was worried about. Also, the movie previews made me want to see it (I'm a big Wild Things lover), but I trust your opinion too much. I know that if you were "meh," I will be too. That's the danger with trying to reinterpret--in a different art form-a beloved piece of work. It's pretty hard to nail it. First, that big quiet character probably represents the person inside all of us who longs to be included in the fun but is too shy to ask. He probably represented Max's desire to be accepted and included. But, that said, I will admit to being totally un-intellectual and very NON literary, so what do I know? Now, I have to ask, am I the only party pooper out there who never liked "Where The Wild Things Are"? I never had an imaginary friend - it was never any fun trying to imagine what other people would say. I never played Barbies by myself - only with friends who could be the personalities of their own Barbies. I was never one much for imagination. Probably the reason I love Math and can NOT get into any literature that isn't 100% straightforward. Does that make me the worst parent ever? That I can't relate to this book? I just don't see the pull. My favorite kids' book is "The Monster At The End Of This Book" by Grover from Sesame Street (aka Jim Henson). But thanks for the review! Now I can save myself $20! I think I will take your suggestion and wait until it comes out on DVD. That way if Miss Pink doesn't like it we can save some money.